*The unique design of the brick and block alignment clips allows for the quickest set up and most portable line guides ever developed. These clips ensure proper alignment of the plurality of bricks with line extending between the adjacent clips. 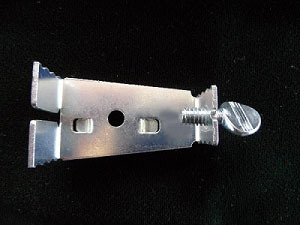 *The toothed surface located on the front of the clip is used to secure the clip on the brick. *The thumb screw located on the rear face can be adjusted to secure and accommodate different size bricks. *The line is secured to the clip by extending through the central slot and around the front and back. *The alignment clips are used with line in pairs of two.